was something far beyond a pleasure: it was access to truths which dwelt in a realer world than I did, truths which, once glimpsed, could never be taken from me by any of the nugatory incidents making up my futile existence, however painful they might be to my body. Young Marcel is desperate to see his heroine La Berma in a matinée performance of Phèdre, by Racine. The only thing that cheered me a little was the knowledge that I was going to be allowed to see La Berma. But, just as the only storms I longed to see were those which raged along the wildest shores, so I wished to see the great actress only in one of those classical parts in which Swann had assured me she rose to the sublime….I knew that if I could ever hear La Berma ….my delight would be the same as when I could step out of a gondola, to stand in front of the Titian in the Frari or the Carpaccios in San Giorgio dei Schiavoni. now that I seemed to be under an obligation to enjoy myself, I found it rather irksome. With such perilously high expectations and the pressure Marcel feels under to enjoy himself, the odds are stacked against a smooth ride. Indeed, on the occasion that Marcel finally goes to the theatre and gets to see La Berma as Phèdre, her performance fails to match his longed for realms of glory. however hard I strained towards her with my eyes, ears and mind, so as not to miss a single scrap of the incentives she would offer me to admire her, I could not manage to find any. It’s not very surprising, is it? Yet, would it have been better for him not to have gone at all? Is it better to leave our idols reigning supreme in our imaginations, and avoid seeing them in action at all costs? I don’t know. At the age of 15, my older brother’s failure to get tickets to see The Smiths, meant I missed out on seeing live the most influential band of my tender teenage years. I was distraught. Then the band split up, and I knew that opportunity had gone forever. I regretted it for years. Morrissey toured repeatedly, but I could never bring myself to go as I feared that no performance could live up to my inner teenager’s expectations. So, even if he puts on a surprise show in Maenclochog Village Hall I will never see Morrissey play live, and if young Marcel were around, he’d totally understand. 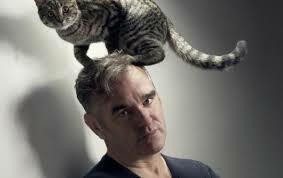 Sorry Morrissey, but I won’t come and see you play, even with a cat on your head. You just need to let it go. ← Do you have just under 9 hours to spare? He would understand! If Proust were here he’d like you way better than me, as my post about this was be saying how ungrateful he was and I might have possibly said he needed a slap 😉 Although I’ve read some fascinating things about how we build tulpas, how for the more sane of us they are essentially a little like real relationships in that there can be deal-breakers. If a performance is not as good as we’d imagined, or if the object of our admiration says or does something unforgivably stupid, the tulpa is wrecked. And sometimes, we are so fond of it, we don’t want to risk having to live with its disappointing or even banal reality. This is why it hurts me when celebs I like tweet with incorrect apostrophe use. 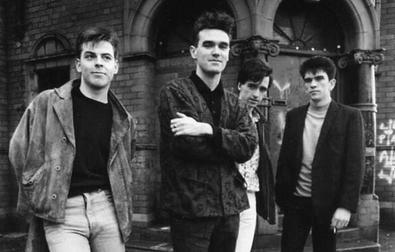 I came to have an ear for The Smiths inexplicably in my early 20’s. Like pickles, it took several years of well-meaning friends’ attempts (Meat is Murder) before I developed the taste. There’s something faintly desperate about seeing band reunions, I think. If hearing their music defined a moment in your youth, coming face to face with your idols, who have aged at the same rate as you have, cannot be anything but miserable. For that reason I steer clear of reunion tours like My Bloody Valentine did recently, as it’d just be too depressing. As Radiohead have continued to produce new music and evolve their sound, I don’t think of them in the same way, although I’ll never forget seeing them at Glastonbury a long time ago. It’s incredible they’ve been so productive for so long! Oh, and you’re right about the pickles, I always found albums by The Smiths needed a few listens! On Radiohead, I concur. They may have some favorite songs but what resonates are the experiences in their evolving sounds. I feel the same way about Wilco, who I have been fortunate to see. One of my white whales is Thea Gilmore. She rarely comes across the pond. The bands that require a few listens before they take hold of your heart. That would be an interesting list! It would indeed! You’ve got me thinking now…. what albums would make it onto my list, i wonder?